This weekend begins the onslaught of pre-Maryland Death Fest and Chaos in Tejas madness, in addition to ongoing general NYC metal-insanity. And for those of you who are looking to take it the hard way (i.e. go to 10 shows instead of one looong one) there are tons of chances to check out some interesting young bands in heavy music. 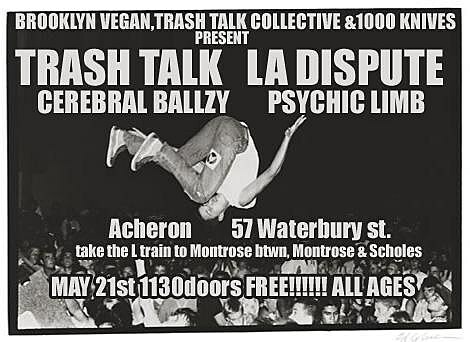 We talked about quite a few shows on the way already, including the FREE and ALL AGES Trash Talk show TONIGHT (5/21) at Acheron. Orphan, Dope Body, Child Abuse will terrorize Union Pool TONIGHT (5/21) as well, with the latter playing a show shortly after the release of their new LP. Zona will host Beau Finley, DBCR, Something About Death or Dying (which includes members of Chambers, The Gaslight Anthem and Spiro Agnew) and Paranoid Critical Revolution for it’s monthly shindig at Zona. The Public Assembly show kicks off on Sunday (5/23) at 8PM. That same night at the Charleston, Tyrhombus Rex will team up with Richmond’s Balaclava (who have a killer new release on Forcefield), Elks (who are playing with Cough at Cake Shop) and Mortals for a show at the Charleston. As previously mentioned, Europa will host not only the Inquisition show on Sunday (5/23) but also the whopper of a show in Verbal Abuse, Capitalist Casualties, Fang, and Magrudergrind on Saturday (5/22). Want to go to Verbal Abuse? I have THREE pairs of tickets available to giveaway. Details on how to win are at the bottom of this post. 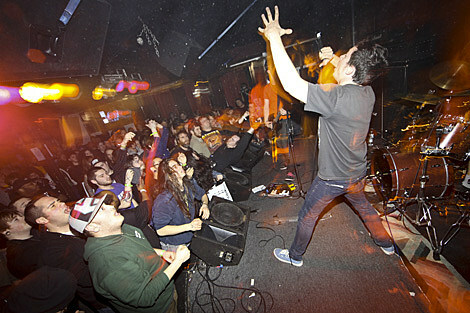 The VA show will take place at the same time that Municipal Waste is packing out Fontana’s across town. To win the Capitalist Casualties tickets, email us at BVCONTESTS@HOTMAIL.COM with a subject line of “Capitalist Casualties”. The winners will be selected at random and contacted.